How does it benefit my body versus those other salts? First of all, what makes Himalayan crystal salt so amazing? About 200 million years ago, there were crystallized sea salt beds that were covered with lava. Because this salt was subsequently enveloped in snow and ice for millennia, it was protected from modern day pollution and preserved in an untouched, pristine environment. The Himalayan mountain range goes across Asia, and passes through China, Nepal, Myanmar, Pakistan, Bhutan, Afghanistan, and India. Many people believe that this pink salt is the purest salt that can be found on the planet. Himalayan Salt contains the same 84 trace minerals and elements that are found in the human body; that alone is quite impressive! A few of these minerals include: sodium chloride, sulphate, calcium, potassium, and magnesium. When consuming this salt, you are actually getting less sodium intake per serving than regular table salt because it is less refined and the pieces are larger. Therefore Himalayan salt has less sodium per serving because the crystals or flakes take up less room than the highly processed table salt variety. 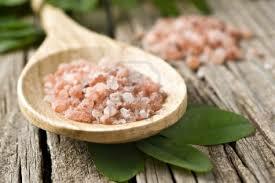 Another great thing about this salt is that, because of its unique cellular structure, it stores vibrational energy. The minerals in this salt exist in colloidal form, which means that they are small enough for our cells to easily absorb. Previous articleNitro Coffee: Hipster Hype or Real Benefits?